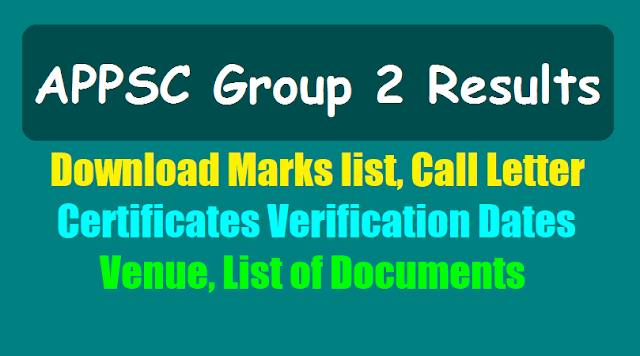 APPSC Group 2 Final Selection Results of Executive Posts (PC-01 to 08): APPSC Group 2 Results Marks list, Call Letter, Certificates verification dates, Venue, List of Documents 2018: APPSC Group 2 Main Exam Results, Certificates verification dates, Venue, List of Documents, APPSC Group 2 Certificates verification dates, Certificates verification Venue, List of Original Certificates for verfication. 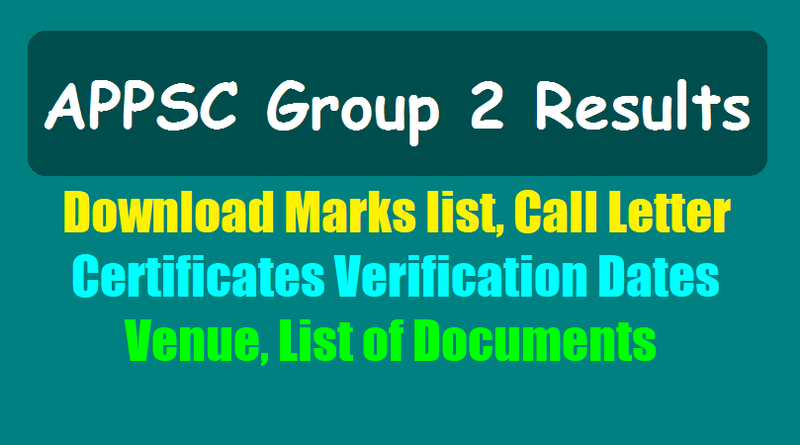 Results Notification for Verification of Original Certificates: APPSC General Recruitment, Group II Services Notification No 18/2016: Results Notification for Verification of Original Certificates: It is hereby notified that on the basis of the merit in the Main Examination held on 15/07/2017 AN and 16/07/2017 FN & AN and as per the terms and conditions of the Notification of Group-II Services (both Executive and Non-executive) vide Notification No. 18/2016 Dt. 08/11/2016, the candidates with the following Registered Numbers are provisionally admitted for Verification of Original Certificates from 18/01/2018 to 01/02/2018, subject to fulfilment of the conditions regarding eligibility. The venue for verification will be communicated soon. The Candidates are picked up for verification in 1:2 ratio considering category wise merit and the Post Code preferences exercised by them. If required candidates do not turn up for verification in any category, next eligible candidates will be called for verification. The result copy can also be seen in the Commission’s Notice Board. at the time of verification of certificates with reference to the particulars furnished by him/ her in the online application form, failing which, they will not be treated as eligible. The Candidate will be disqualified at any stage in the process of selection. The Commission has the Right to disqualify any candidate, if he/ she is not eligible for any reason. 4. Other relevant formats from the Commission’s Website www.psc.ap.gov.in . Marks list of all the candidates who appeared examination is available in Commissions website. Individual Memos will be sent to the candidates in due course. Even if memo is not received through post, the concerned candidate can download the memo and approach the verification with relevant certificates and check lists. If any relevant certificates are not produced, the candidature of the candidate would not be considered for selection and further time would not be granted. The candidates who opted for Post Code Nos 9,10,11,12 and 17, 18, 19, 20, 21, 22, 23, 24, 25, 26, 27, 28, 29, 30, 31 and 32 only shall have to qualify the Computer Test conducted by APPSC in due course of time ie Proficiency in Office Automation with usage of Computers and Associated Software to consider their candidatures for the said Post Codes in the selection process. The date and time of the test will be communicated soon. There is no Proficiency Test for Post Code Nos 01,02,03,04,05,06,07,08,13,14,15,16,33 and 34. All the candidates picked up under PH category have to undergo Medical Examination at respective Medical Boards at Visakhapatnam. The date of Medical Examination would be communicated to the respective Candidates soon. Also those who opted Post Code No. 08 will have to bring Physical Fitness Certificate from the Competent Authority for Verification.